There's a lot of psychology involved in winning new customers. 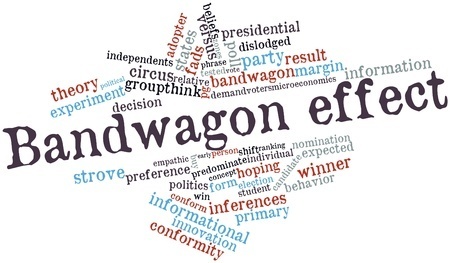 And there's one psychological technique which is slowly winning over businesses across the world: the bandwagon effect. Has your company tried it yet? We’ve all heard the old saying about jumping on the bandwagon, and it’s this adage that’s spawned the moniker ‘the bandwagon effect’. In a nutshell, it refers to the process by which people make decisions more readily if they’ve seen others do the same. By fully understanding this ingrained psychological response, you can actually tweak your marketing strategy and win more business than ever before. In today’s post, we’ll give you the full low-down. Have you ever wondered why so many people buy into popular trends? From the latest and greatest iPhone to the latest 50 Shades darker, all of these trends have one thing in common: their success is driven by the bandwagon effect. The absolute basics of this concept suggests that people are likely to do certain things because other people are doing them. It often bears no relevance to taste, preference, or even common sense – they simply have to have whatever the thing may be. And we all fall victim to this; none of us are exempt. The bandwagon effect has been responsible for movie phenomenon, breakout music acts, and stellar product launches – so how can you get in on the action? Without delving too deeply into human psychology, the reason that the bandwagon effect is so effective in driving adoption of products, concepts and beliefs, is that we all want to feel accepted and part of the whole. Even those of us who deny it are part and parcel of this psychological quirk. When we get our first iPhone or that ‘must-have’ album that everyone’s talking about, it suddenly feels like we’ve joined an elite club. All of a sudden we understand what everyone’s been going on about, and it makes us feel good. It really is as simple as that. So how can we apply this to business? 77 people in your street are already members. Have you joined yet? Your friends are already enjoying our widgets. Isn’t it time you gave them a go? Over 80% of people have discovered the taste of our chocolate. Now it’s your turn. Whether you use persuasive copywriting like this as headlines or subject lines for emails (or anywhere else), it doesn’t really matter. The idea is that, by phrasing your sales proposition in such a way, you’re triggering the psychological response that’s responsible for the bandwagon effect. So why not give it a try? Everybody else is already doing it. Before you get started, you should also check out the AutoVu platform. If you’ve always wanted a way to make customer relationship management super-easy, AutoVu is the answer.